Wanted items or items for sale listed for free on KMMO. No Garage or rummage sales on Swap Shop. We have the Rummage Sale Round-up for that. If it is your primary source of income, please don’t advertise it on the Swap Shop. You may list only ONE phone number or one address on the Swap Shop. If you have a question as to what can go on the Swap Shop please ask the person answering the phone if your item can be advertised on Swap Shop, they will be happy to help you. To participate, call 886-5666 or 1-800-727-5666 Monday through Saturday between 9:20 and 10 AM. CLICK ON THE DATE BELOW FOR DESIRED SWAP SHOPS! CHECK OUT THE GREAT ITEMS ON TODAY’S SWAP SHOP. GET OUTDOORS WITH TODAY’S SWAP SHOP! FROM MOWERS TO CAMPERS AND POINTS IN BETWEEN YOU CAN FIND IT ON TODAYS SWAP SHOP! ITS A SHORT WEEK CHECK OUT THE LIST FROM TODAY’S SWAP SHOP! GREAT ITEMS MAKE UP TODAY’S LIST ON THE SWAP SHOP. CHECK OUT TODAY’S SWAP SHOP! CHECK OUT THE GREAT ITEMS THAT MAKE UP TODAY’S SWAP SHOP LIST. It was a little chilly outside this morning, however the deals were hot on the radio during today’s Swap Shop! Click on the headline to see all the great deals! LOOKING FOR A NEW TO YOU MOWER? LOOK AT TODAY’S SWAP SHOP LIST. CHECK OUT THE GREAT ITEMS FOR YOU ON TODAY’S SWAP SHOP! Check out what could be yours on today’s Swap Shop!! Check out the great items on today’s Swap Shop! Check out the variety of items available on today’s Swap Shop! 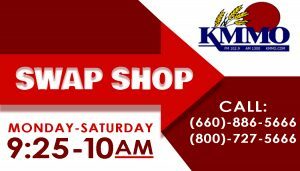 Check out the Friday edition of Swap Shop! Check Out today’s call on the Swap Shop! It’s a full house on today’s Swap Shop! Get outside with today’s Swap Shop! We start April with a very busy Swap Shop show for this Monday! Click on the headline to see all the great deals! It was a busy Swap Shop this Saturday morning, with 21 calls featuring all sorts of great deals. Click on the headline to see them all! Stay dry when you shop the Swap Shop! Get rolling into spring with today’s Swap Shop!